A couple weeks ago an online craft supply store here in Malaysia was having a big sale – everything in their shop was on sale! Well, as all you crafters out there know, that is a HARD offer to refuse! I actually ended up making THREE different orders from that shop in the duration of their 10 day sale. I bought some things I needed anyway, but I also bought some new things just because I wanted to try them. As usual whenever I buy new supplies I immediately start having new ideas about how I can use them. In today’s tutorial I am using three different new things that I bought from that sale! The idea for these earrings started when I decided to buy some headpins. I haven’t actually used headpins in jewelry making before, but I thought it’d be a fun new thing to try! Of course if I use headpins then that means I need some round nose pliers to be able to turn the top of the headpin into a circle. Luckily the shop had those as well, so into my cart they went! Their beads were also on sale. I am not a huge collector of beads, but I love stone beads so I couldn’t resist and bought several types of tiny little stone chip beads . I decided paper and stone are both natural materials so they’d go well together in jewelry. So with those (and many other!) new supplies heading towards my door, the idea for these earrings was born. For these earrings I used paper that was 3mm in width. You can use other widths for different looks. To make these cute earrings, first you need to roll your paper into tight rolls. 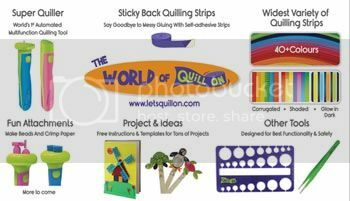 Insert the end of the paper into your quilling tool and roll, keeping it snug and straight. 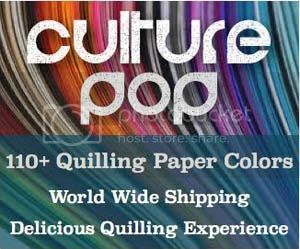 Gently but firmly pull the roll off of your quilling tool and glue the end shut. These photos are of green paper from another tutorial, but you get the idea. Shown is how you can carefully remove the roll without making the middle unravel. Touch your thumbnail against the tip of the tool as shown in the second photo. 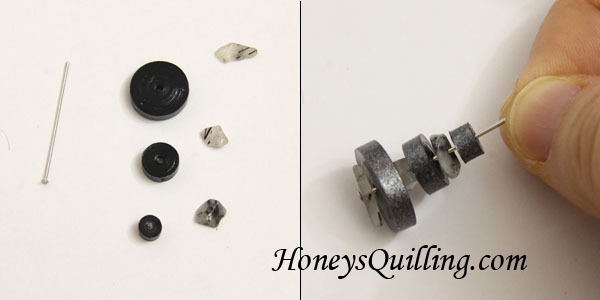 Shown in the first photo here are three rolls, three stones, and one head pin which is what you need for each earring. Before assembling your earring, you may want to use sealant on your paper discs. You can skip this step if you prefer, but your earrings will not be water resistant and the roll might come undone sometime. So I would suggest a layer of sealant! For this pair I first dipped each disc into liquid sealer and let it dry. I like this sealant because it really soaks into the paper and makes it stiff. It is very liquid so I know I don’t miss any surfaces! Then I used diamond glaze on both sides (letting one side dry before doing the other) to give extra water resistance and some nice shine. Find diamond glaze find it at Scrapbook.com, Blue Moon Scrapbooking, or on Amazon . Once your pieces are sealed and dried (this was the first time I used diamond glaze and I was impressed at how quickly it dries!) you can assemble your earrings! Place a stone bead on your headpin, then the biggest disc, another stone bead, the medium disc, another stone bead, and the smallest disc. Now comes the slightly tricky part – turning the top of your head pin into a loop. Honestly, this was one of my first times doing this. To see a professional tutorial on this, check out this great pic tutorial which I referred to when I was trying. Basically you use your chain nose pliers to bent the top of the head pin to a right angle. Then switch to your round nose pliers to hold the wire close to that bend. Use your hands or your chain nose pliers to wrap the wire around the top of the round nose pliers to get the circle. Here’s where I had slight difficulty because my head pin was almost exactly the right size, so I didn’t have extra length to play with. A longer head pin would make for easier looping. Now I know! But it works and I won’t be selling these until I am good at this looping thing, so my nieces and friends will have some earring gifts coming to them while I practice! Once you have wrapped the wire you may find you have a little extra wire. Just use your wire cutters to snip it off (either ware some safety glasses or do this under a tissue or something so the little wire doesn’t fly off somewhere and hurt you! Here is the finished pair of earrings! Another thing I noticed was that one earring ended up a bit longer than the other because of the size difference of the chips. So if it’s important to you that both earrings be exactly the same length, be careful when choosing your chip beads, or change to round beads instead. I do like the look of these naturally shaped stones, though. When I was planning these earrings I actually made more discs, but found that my headpin was too short to accommodate all of them. Therefore a second pair was born! This pair has only 2 paper discs, but 4 stone chip beads. The discs in this one are made from a 24″ length of paper and a 6″ length of paper. Check out that top loop on the left hand side earrings – my best one yet! Hopefully soon ALL of them will look that good! Once I get good enough at making those top loops I’m going to invest in some niobium head pins so I can add some of these cuties to my etsy shop!